The transformational potential of RegTech has been confirmed in recent years with US$1.2 billion invested in start-ups (2017) and an expected additional spending of US$100 billion by 2020. Regulatory technology will not only provide efficiency gains for compliance and reporting functions, it will radically change market structure and supervision. This book, the first of its kind, is providing a comprehensive and invaluable source of information aimed at corporates, regulators, compliance professionals, start-ups and policy makers. 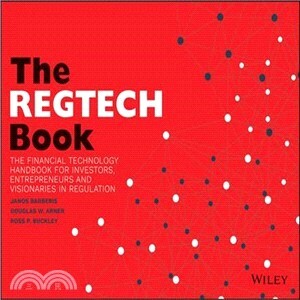 Edited by world-class academics and written by compliance professionals, regulators, entrepreneurs and business leaders, the RegTech Book represents an invaluable resource that paves the way for 21st century regulatory innovation. Susanne Chishti?is CEO of FINTECH Circle, Europe's 1st Angel Network focused on fintech opportunities, Chairman of FINTECH Circle Innovate and Co-Founder of "The FINTECH Book," the 1st crowd-sourced book on fintech globally. Selected as one of the 100 leading Women in FINTECH and top 15 FINTECH UK Twitter influencers. Susanne is also a Senior Capital Markets Manager, Entrepreneur and Investor with strong FINTECH expertise. She is also a mentor, judge and coach at FINTECH events such as SWIFT Innotribe, Cambridge Judge Business School Accelerator and Fintech Startup Bootcamp. She has more than 14 years’ experience across Deutsche Bank, Lloyds Banking Group, Morgan Stanley and Accenture in London and Hong Kong and was selected among top UK FINTECH Influencers by City A.M.
Janos Barberis?founded FinTech HK, which he established to spur Hong Kong's FinTech eco-system. This led him to produce Hong Kong’s first FinTech report viewed over 14’000 times. He was appointed as a Senior Research Fellow at the Asian Institute of International Financial Law (at The University of Hong Kong) specifically focusing on developing regional Fintech regulatory frameworks. In parallel, Janos sits on the advisory board of the World Economic Forum’s (WEF) FinTech Committee. Previously, Janos was an Associate at a prospective UK retail bank, Lintel, helping it to secure a banking license from the PRA & FCA. His role follows a specialist interest developed over 7 years in financial systems and their stability. ?